The global market for hybrid operating rooms is gaining tremendously from the significant rise in technological advancements, especially in emerging economies. The prominent increase in the adoption of robotic surgeries in a number of countries, such as Japan, China, Taiwan, and Korea has been adding remarkably to the growth of this market. The augmenting investment for research and development by several end-use industries, such as the medical and healthcare and the government sectors, is also supporting this market across the world. Going forward, the global market is expected to maintain its high growth pace in the near future, thanks to the presence of favorable government norms and policies, increasing preference for minimally invasive surgeries, and the massive investments for the development of novel technologies that can help in improving healthcare systems for patients. The market’s opportunity is anticipated to reach US$661.8 mn by 2017. It is further expected to proliferate at a CAGR of 4.60% between 2017 and 2022, increasing to US$828.1 bn by the end of 2022. Overall, the future of this market looks bright; however, several challenges, such as, the high cost and complexity of the deployment of hybrid operating room equipment, may affect this market adversely in the years to come. In general, the global hybrid operating room market is evaluated on the basis of the type of the component, end user, and the application. Based on the type of the component, the market is categorized into intraoperative diagnostic imaging systems, surgical instruments, operating room fixtures, and audiovisual display systems and tools. Intraoperative diagnostic imaging systems report a comparatively higher demand than other components of a hybrid operating room across the world. This trend is expected to continue over the next few years. Based on the end user, the market is classified into hospitals and ambulatory surgical centers (ASCs). By the application, the market is divided into cardiovascular, neurosurgical, thoracic, and orthopedic disease treatments. The Middle East and Africa (MEA), North America, Europe, Latin America, Asia Pacific (APEJ), and Japan are the prime regional markets for hybrid operating rooms across the world. Among these, North America has emerged as the key contributor to the global market for hybrid operating rooms, thanks to the presence of advanced medical and healthcare infrastructure in North American countries, especially in the U.S. and Canada. Researchers expect the North America market for hybrid operating rooms to maintain its leadership over the next few years on account of the increasing investments by hospitals for the upgradation of their operating rooms. The augmenting number of ambulatory surgery centers and escalating need for surgical procedures are also expected to add to this regional market over the forthcoming years. Among the other regional markets for hybrid operating rooms, the APEJ region is projected to demonstrate a steady rise over the forthcoming years, owing to the advancements in technology and medical and healthcare infrastructure, together with the surging disposable income of people in this region. The APEJ market for hybrid operating rooms is predicted to expand at a CAGR of 5.10% over the period from 2017 and 2022. Toshiba Corp., Trumpf Medical, IMRIS Inc., Eschmann Equipment, Stryker Corp., MAQUET GmbH, Skytron LLC, Koninklijke Philips N.V., Siemens Healthineers, and GE Healthcare are some the leading players functioning in the global operating room market. The global market for hybrid operating room is witnessing a substantial rise in its valuation, thanks to the technological advancements in the field of operating room equipment. With the increasing government support, the market is expected to continue to rise at a high growth rate in the near future. A comprehensive assessment of the global market for hybrid operating rooms has been offered in this research study that intends to present detailed information with deep insights into this market to readers in a bid to assist them in gaining a better understanding of it. The report estimates and forecasts the worldwide hybrid operating room market on the global as well as the regional levels. It consists of a comprehensive analysis of the value chain for each of the segments. The assessment of the value chain also offers an in-depth information about the value addition to the market at each of the stages. 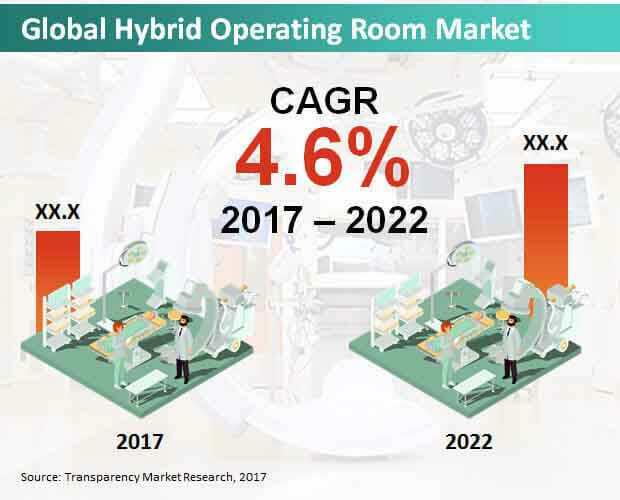 Further, the study discusses the drivers and the restraints of this market, coupled with their impact on the demand for hybrid operating room equipment during the period from 2017 to 2022. The report also discusses the key market indicators, which impact the growth of the global hybrid operating room market considerably. It assesses the opportunities in this market by examining the market trends thoroughly. The drivers, limitations, opportunities, and the scope mentioned in the report have been justified by utilizing quantitative and qualitative data and have been verified by the primary and secondary resources. Moreover, an analysis of the average price trends and the substitutes have also been presented in this research study. The research study provides a comprehensive overview of the worldwide market for hybrid operating room by evaluating it on the basis of the type of the component, end user, application, and the regional spread. Based on the type of the component, the market has been categorized into surgical instruments, operating room fixtures, intraoperative diagnostic imaging systems, and audiovisual display systems and tools. Based on the end user, the market has been divided into hospitals and ambulatory surgical centers (ASCs). By the application, the market has been segmented into cardiovascular, neurosurgical, thoracic, and orthopedic disease treatments. In terms of the geography, the market is classified into Asia Pacific excluding Japan (APEJ), the Middle East and Africa (MEA), Europe, Latin America, North America, and Japan. These market segments have been evaluated on the basis of their current, historical, and future trends. The research report includes a thorough competitive analysis of the global hybrid operating room market, taking the profiles of the leading players and their market shares in consideration. The leading players profiled in this report are Toshiba Corp., Trumpf Medical, IMRIS Inc., Eschmann Equipment, Stryker Corp., MAQUET GmbH, Skytron LLC, Koninklijke Philips N.V., Siemens Healthineers, and GE Healthcare. The product literature, annual reports, press releases, and relevant documents of these players have been reviewed for a better understanding of the competitive scenarios of this market. The company profile includes a number of attributes, such as the overview of the firm and its business, brand, and finances. The business strategies, recent developments, key competitors, and the number of employees have also been discussed in this section of the report.